The promotional campaign organized by The Duqm Special Economic Zone Authority (SEZAD) in line with efforts done to introduce investment opportunities in the Sultanate and attract investors in Duqm, kicked off today (Monday, September 9,2013) at Novotel Singapore. The Omani delegation, headed by HE Yahya bin Said bin Abdullah Al Jabri, Chairman of SEZAD, presented a variety of worksheets through which the projects, investment opportunities, incentives and tax excemptions available in SEZAD were showcased. The delegation pointed out to the abundance of the investment opportunities in many fields, such as logistics, tourism, fishery industries complex and the oil and petrochemical industries complex. The participating officials from SEZAD, governmental offices and agencies, and corporations presented the benefits and incentives delivered to the investors, and investment environment in the Sultanate of Oman. Showcasing investment opportunities HE Yahya bin Said bin Abdullah Al Jabri asserted that the promotional campaign aims to inviting the Singaporean businessmen and investors to invest in SEZAD, in particular, and the Sultanate in general. HE Al Jabri said that the meeting focuses on presenting the investment opportunities in SEAD, established by the Sultanate under the national attitude of diversifying income sources, attracting foreign and domestic investments and developing the governorates of the Sultanate; in order to have the SEZAD as a model for the economic development which represents a strategic value within the comprehensive social and economic development plan. HE Al Jabri expressed his hopes to have the promotional campaign \\'Duqm Calls\\' an effective factor in deepening the economic cooperation between Singapor and Oman, under the warm bilateral relations; pointing that the voyage of the ship \\'Jawharat Muscat\\' from Muscat to Singapore in 2010 is the most prominent example of the depth of friendship and cooperation between the two countries. Oman - Singapore partnerships HE Chairman of SEZAD called businessmen in Singapore to invest in the Sultanate, saying \\'although there are many Singaporean investments in Oman in many projects, such as the power plant and water distillation plant in Dhofar Governorate, we - in SEZAD - are looking forward to have more joint investments in SEZAD\\'. 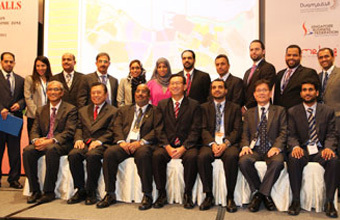 Al Jabri highlighted the efforts done by the Oman- Singapore Joint Committee that contributed in creating Omani- Singaporean partnership inside the Sultanate by the investments of many Singaporean companies in Oman in the areas of information technology, contracting and a variety of economic activities. Diverse benefits and incentives Al Jabri asserted that the investment opportunities available in SEZAD are characterized by diversity, covering all tourism, industrial, trade and logistics sectors; and explained that SEZAD has many advantages, including its location on an open sea near the big consumer markets in Asia. \\'SEZAD offers many tax benefits and incentives; all kinds of business and investments are exempted from tax, the tow conditions of the minimum capital and commercial property for non- Omani are not in place, no restrictions on hard currency exchange and trading, and an exemption of the provisions of Commercial Agencies Law. Moreover, Oman- thanks to Allah- is blessed with security and political stability and has a strategic location; in the middle between West and East, near from the global shipping lanes\\', Al Jabri said. Economic growth HE Al Jabri exalted the achievements Singapore has made, saying that \\'Singapore has succeeded in building a strong and diversified economy that became one of the biggest economies in Southeast Asia; Port of Singapore is the second most active port all over the world. What Singapore has made, in terms of economic achievements, is something of which all its partners are proud. We, in the Sultanate of Oman, appreciate the efforts done by Singapore to create prosperity for the people of Singapore\\'. HE highlighted the economic growth and social development the Sultanate made during Renaissance. \\'Oman has made growth rates that enhanced its economic position in the region through executing a number of infra-structure projects; pursuing the diversification of national income sources; and encouraging private sector to be a prosper and strong one; in order to create investment opportunities for foreign and local companies. Oman offers incentives for attracting foreign investment and didn\\'t spare effort to develop regulations of foreign investment in the Sultanate\\'. Al Jabri, further, added.